By Marcus Richardson: On October 13th, former WBA World lightweight champion Brandon Rios (30-0-1, 22 KO’s) will be facing unbeaten light welterweight contender Mike Alvarado (33-0, 23 KO’s) at the Home Depot Center in Carson, California, according to the 26-year-old Rios. The Alvarado-Rios fight will be taking place on the same card as Nonito Donaire against possibly Toshiaki Nishioka. A fight between Alvarado and Rios will be an in house Top Rank promoted fight, as both guys are with Bob Arum’s Top Rank stable. It’s a good fight for Rios, and a risky one for Alvarado, because Rios just won a fight over Cuban Richard Abril by a 12 round split decision last April and he didn’t look like he deserved the win. Top Rank has a lot of hopes for Rios, and they were almost dashed by that performance. Alvarado isn’t as well known as Rios and he may find it hard to win a decision against him unless he really gives Rios a beating. I thought Rios fought well enough against Abril to lose by a 10 rounds to 2 score. 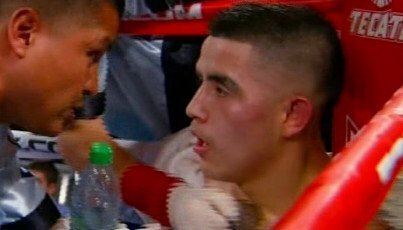 I still can’t see what the judges saw in Rios’ performance against Abril to give him the fight, because he was dominated the entire fight and looked to be clueless. The win for Rios didn’t keep him from taking huge amounts of criticism. He might as well have lost the fight because he looked so bad. By getting the decision it just made Rios look like a fighter that was given a hometown decision. This is a very hard fight for Rios for his first bout at light welterweight and I don’t know how well he’s going to do in this fight. Rios’ main advantage at lightweight was that he was bigger than everyone he fought weight-wise. But at light welterweight, Rios won’t be bigger than his opponents and that could be a problem for him. He was a decent puncher at lightweight, but at light welterweight he’s nothing special. He could get exposed immediately by Alvarado, and be left wondering what he’ll do with his career. My guess is if Rios takes enough losses at 140, he’ll find a way somehow to get back down to 135 and make weight. I like Alvarado in this fight because he’s stronger guy with a bigger frame a busy style. He’s going to give Rios a real pounding.